Home > Football, West Ham United FC	> Finally someone I know………. Just popping in to hold the shirt ! 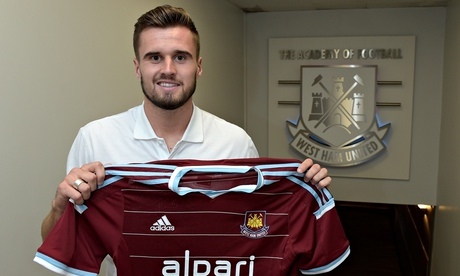 Today, WHU announced that Carl Jenkinson has been signed on a season long loan from Arsenal. This is good news. Young, recent England call up, and knows the league. And he’s half decent. Sam’s summer of attack continues. The question is , will he take Demel’s place, or is he just backup? Just be like Sam to take a great prospect and stick him on the bench. Before I get too carried away, lets not forget our last season long Gooner was Henri Lansbury…..